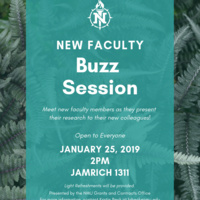 Join us for the New Faculty Buzz Session! At the Buzz Session, faculty who are new to the university talk about their research. This event is a great way to learn about the awesome research happening at Northern, and to connect new faculty members to researchers across campus. Everyone is invited!